We continue our blog post series that will help you learn more about permissions and security in Confluence. If you are reading our blog for the first time, you can check our articles related to Confluence administration. If you don’t know what to do first after Confluence installation, you can check some useful resources that will help you start your Confluence experience. The SU for Confluence app from The Plugin People that allows you to avoid continuous and annoying logging in and out while troubleshooting user issues. The Security and Encryption for Confluence app from ServiceRocket that helps you to hide sensitive information on Confluence pages. The name of the app we will tell about today speaks for itself. 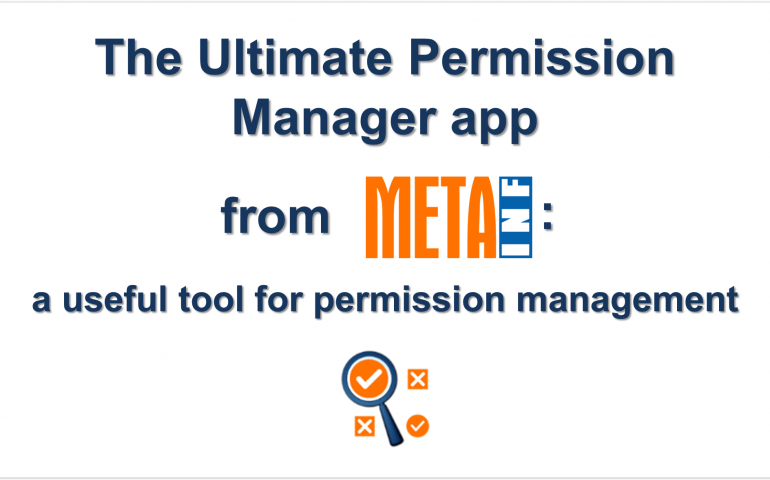 Welcome the Ultimate Permission Manager app from META-INF. 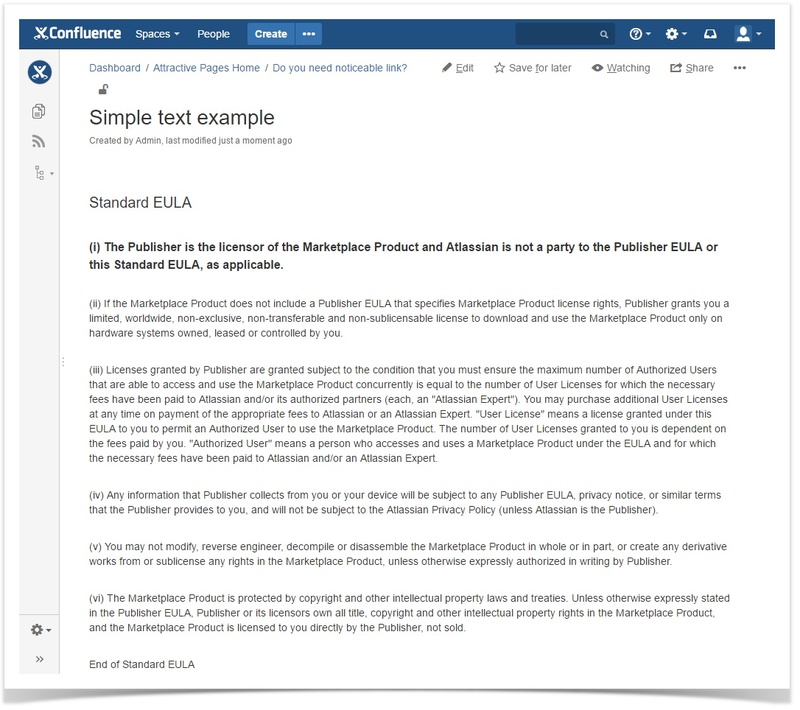 Confluence offers three levels of permissions: global, space and page level. In addition, group and individual permissions are combined. 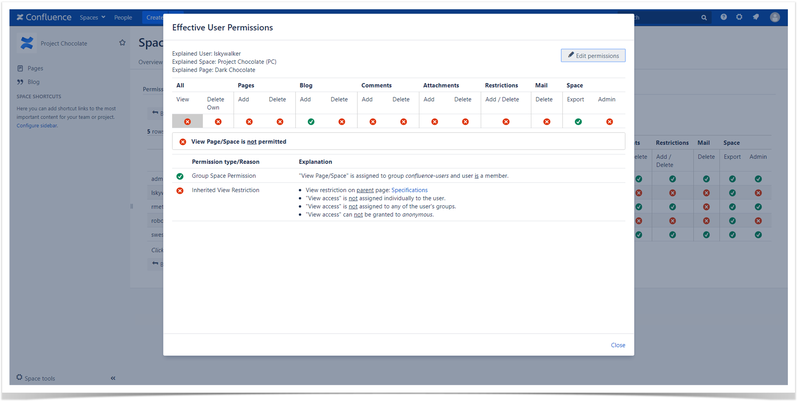 As a Confluence administrator, you need to check various settings before you understand what permissions this or that user really has and what should be done if you want to grant permissions or apply restrictions. It is really a hard job especially if you have lots of user groups and spaces within your corporate Confluence instance. Besides, these spaces may contain many page branches with different restrictions applied. 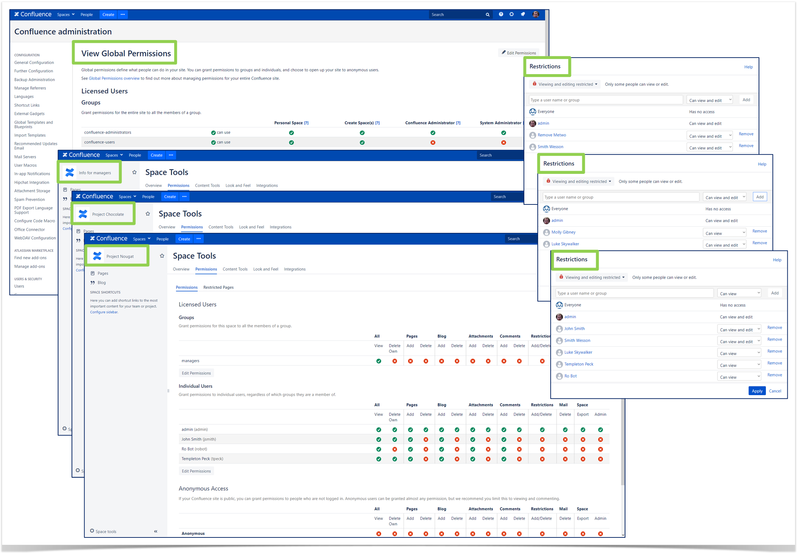 Sometimes it can be very confusing and that is why the Ultimate Permission Manager app can become a lifesaver for any Confluence administrator. This handy app allows you to easily set individual or group permissions for multiple spaces right in the administrator console. Cool? But that’s not all. Let’s take a closer look at the app. The Ultimate Permission Manager app helps you to build user-space or group-space permission matrices. This means that you can easily view all the details and edit individual or group sets of permissions respectively. The green, yellow, and red icons represent permission statuses: green for full, yellow for partial and red for no permissions. You can click these permission icons for more details. Another handy feature is the Effective User Permissions tab that can be accessed from the Space Tools. Here you can explore permissions and restrictions of every page within the current space in one click. The Ultimate Permission Manager app also provides you with the Who Can View macro and the Who Can View button. They allow you to list every user who can view the page. 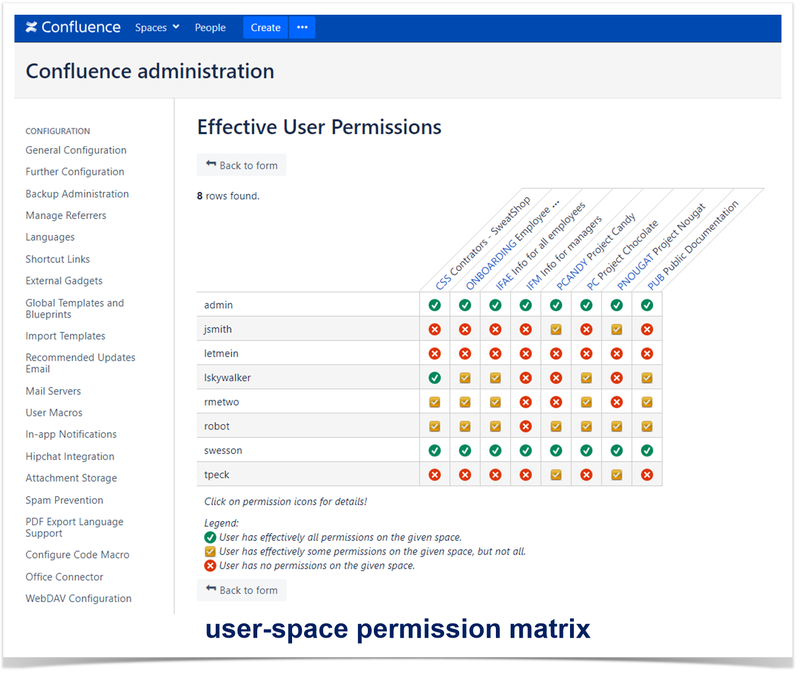 It is obvious that blog posts cover only some main features of the apps that help you to empower Confluence permission management. For more details and useful hints take our ‘Advanced Permission and Security Management in Atlassian Confluence’ course. This course provides every student with Confluence Server and Crowd lab environment. You’ll complete lots of practical tasks and receive feedback from our instructors. Moreover, you’ll get discounts from such Atlassian vendors as META-INF, Comalatech and ServiceRocket in case you decide to purchase any of the apps we describe in the course. And, finally, META-INF featured a special bonus lesson for you. It will definitely help you to widen the gained skills. Join our learning program and enjoy your study with StiltSoft! For more details feel free to contact courses@stiltsoft.com.